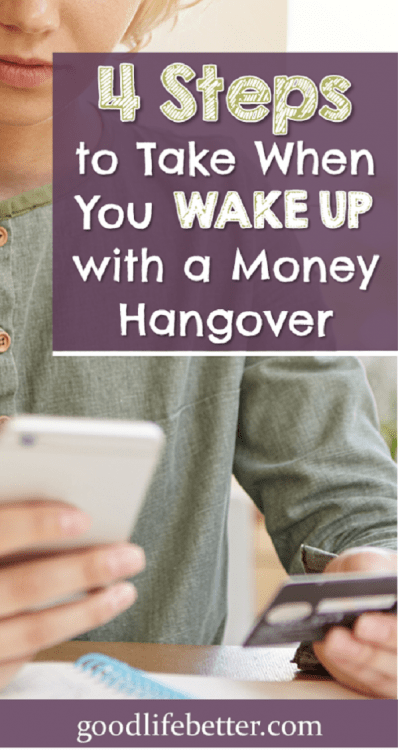 4 Steps to Take When You Wake Up with a Money Hangover | Good Life. Better. 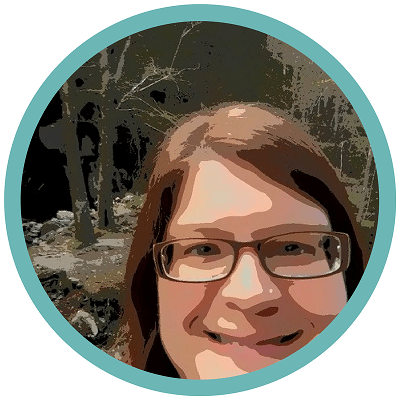 I love a good story and since I started my debt-free journey in January 2017, I have read and listened to countless stories of other women who got out of debt, started spending intentionally, and were on their way to financial independence. These stories not only motivated me to keep chipping away at my roughly $60,000 in debt but often provided helpful strategies for living well while living on less. A common theme from these stories is reaching a point where the status quo—being in debt, not having a plan—was so unpleasant and uncomfortable than the women almost had no choice but to chart a new course when it came to their money (for some examples, check out a series of interview posts from Liz at Chief Mom Officer). Preventing a money hangover also requires you to reflect before your act. Instead of pulling out the plastic yet again to buy new throw pillows or a pair of shoes, or book that last minute trip to Las Vegas, you are able to pause and think about what that purchase means in the longer term. The capacity to prevent a money hangover can happen overnight after a particularly costly experience—a medical bill or a home repair charged to a credit card, for example. Or, it can creep up on you in a more stealth way: seeing your balance and thinking you’ve been hacked only to realize that all of those charges were, in fact, legitimate. What matters is that you nurture that capacity so you can start thinking long-term about your money. 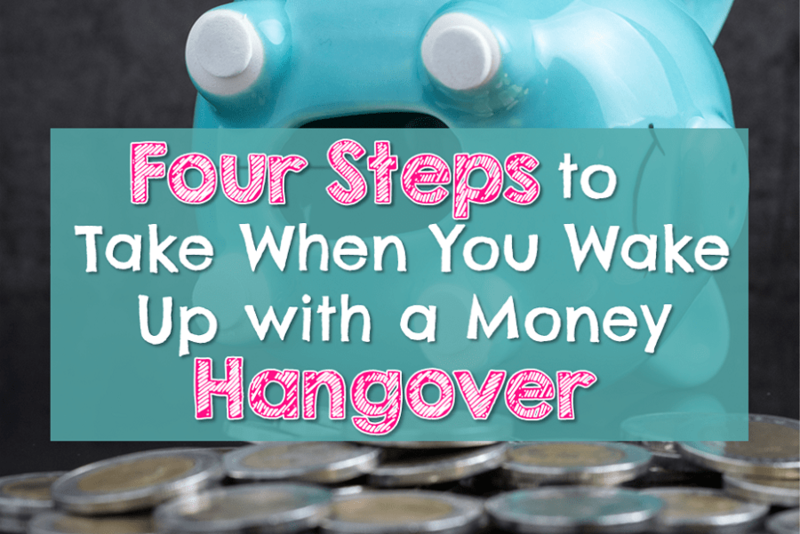 Follow these four steps and money hangovers will become a thing of the past. The first thing to do is take stock of your current situation. While inevitably there are things you are doing now that you should stop doing, other things might be okay. You won’t know until you have a clear picture of your finances. I have been using Mint.com since late 2014 to track mine. It takes a few minutes to link up all your accounts, but once you do, Mint provides you a dashboard of your balances so you can easily see where you stand. The first time I saw my net worth in the Mint dashboard, I was a actually surprised that it was as high as it was, especially given my level of anxiety when it came to money. You might be surprised too! Once you know what you have, you can figure out your savings goals. In the beginning, you will probably have no idea how to calculate this (I know I sure didn’t! ), so be patient with yourself. When I started, I tried a bunch of the different online calculators, read books, and even attended a 2-day seminar sponsored by my employer. As I learned more, my “number” changed. For example, when I wrote this post, How to Motivate Yourself to Save for Retirement, I said my goal was to save $2.28 million by December of 2035. However, since that time, I have dug deeper into retirement benefits offered by my employer and what I could receive in social security. I have also developed more precise estimates of my expenses in retirement: housing, health care, food, travel, etc. Based on this research, I think I will still be okay having saved more like $1.6 million (which I know still sounds enormous but I already have a nice amount saved and more than a decade to make it happen). The time I invest in thinking through even the small details is time well spent: I don’t want to run out of money but I also don’t want to forgo doing stuff now that I truly can afford. With a savings goal in place, it is time to execute by translating that goal into monthly and yearly targets. Assuming an average return on my investments, to reach my goal I need to save right around 30% of my income from my full-time job. I think I can do this, especially since this doesn’t include income from other sources, such as my side hustle and this blog (which isn’t profitable yet but which I hope will one day generate revenue). When it comes to returns, there are no guarantees, of course. To achieve my targeted return, I invest my savings in a portfolio that offers an opportunity for growth but is not so risky that it makes me uncomfortable. Your portfolio could look different. Just know that keeping it in a regular savings account does not mean you are avoiding risk: as each year passes, inflation will mean that money will be worth less because of the rising cost of goods and services. The reason you monitor your finances is not to cause anxiety and stress—quite the opposite. It is to ensure your retirement goals stay front and center so you continue to stay motivated to avoid the dreaded money hangover. I like to calculate my net worth once every four months. When the markets are doing well, this exercise leaves me feeling upbeat and reminds me my sacrifices today will benefit me tomorrow. When the markets are doing poorly, a check-in is an opportunity to congratulate myself on having a plan and not letting the day-to-day market swings persuade me to act irrationally. These are the times when I like to quote Warren Buffet: be fearful when others are greedy and greedy when others are fearful. 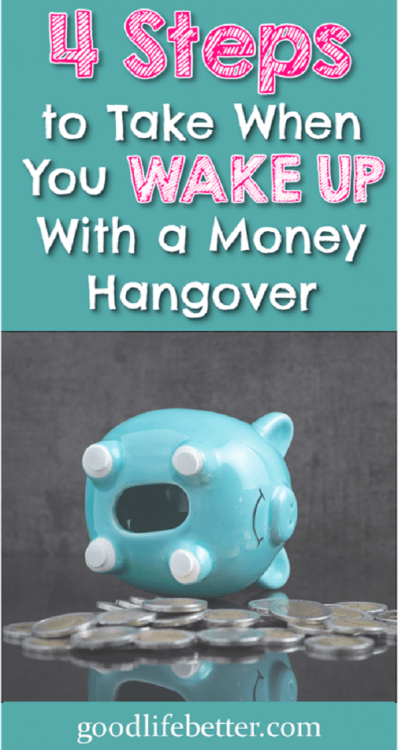 I awoke from my last money hangover during a three month spending fast I undertook during the summer of 2016. Not being able to distract myself with shopping forced me to be alone with my thoughts. Turns out, I wasn’t in a good place. I was struggling with anxiety, I wasn’t sure where my career was going, I had regained weight I had lost, and—while I had a decent amount saved for retirement and had no problem paying my bills—my debt just didn’t seem to be going down. I was no longer content with the status quo which motivated me to chart a new course. What Was Your ‘Ah-Ha’ Moment? If you have read this post all the way to the end, I suspect you have already had your ‘Ah-Ha’ moment. What was it? Let me know in the comment section below! Shopping therapy does work for a lot of people, in fact, according to a study from the University of Michigan, it is 40 times effective in relieving stress when they actually bought something. But just like a shot or two of our favorite drink, it is temporary. If it does relieve stress I agree it is a very short-lived relief. Thanks for stopping by!